I think we all could agree a little extra money this time of year would be sweeeet! This week, I’ve teamed up with some of my fellow bloggers to give you the chance to win $200 in PayPal cash to purchase whatever your little heart desires! I personally have my eye on a beautiful cashmere scarf (hope my husband is reading this! ), but presents for the kids, some new ski gear or even a generous donation to a charity are all possibilities. How would you spend $200 if it landed in YOUR hands? Wait for the rafflecopter box to load below (if it takes too long, try another browser) and log in using the facebook tab or your email (spam safe). Follow the instructions. So much fun! 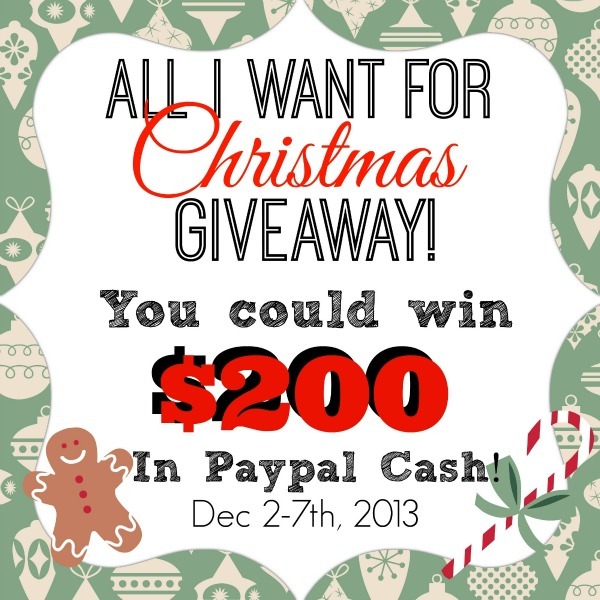 I have entered for today – what a great giveaway!! I’ve got my eye on a cashmere turtleneck sweater! Oh, I love cashmere. Good luck! Buy gifts for my 3 daughters. There is so much I could do with $200, but what I would really love to do is take my BF out for a nice romantic holiday dinner at a super fancy restaurant – one thing we have never done before! Ooooh, I’d definitely buy something great for my husband! id buy some material ive wanting to buy for awhile.